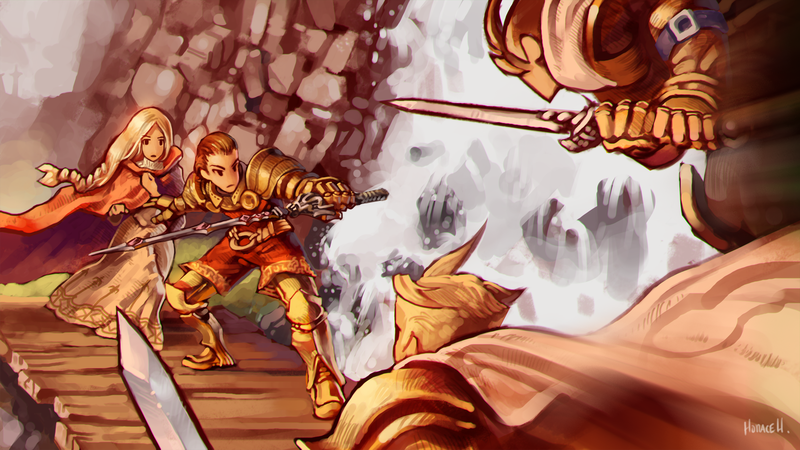 Final Fantasy Tactics: The War of the Lions is a true classic. The story gets a little odd near the end, but generally its really well written. It leads you through the intertwined lives of several characters at odds to unravel a murky conspiracy. My favorite part of the game was and will always be the job system. The way you unlock new jobs is to achieve at a certain level in one or more other jobs. The combination of current jobs and known skills make the team dynamics limitless. I still remember attempting to mentally calculate the best option with my favorite Mathematician Dragoon to deliver hellish justice from the skies. Or finding that one Red Chocobo with unusually high stats that you could perch up high and rain down meteor after meteor on your opponents. When your teammate's health is reduced to zero, they're rendered unconscious with a counter above their head. You then have three of that character's turns to revive them or end the battle before they're converted to a crystal that will heal and transfer skills or chest with one of their items. If a knight manages to break through and smack your healer, it can change the tone of the entire battle. When its the enemy, you can draw out the battle to gain some much needed items early in the game. Its that difficulty and sense of accomplishment when leaving a battle with everything you wanted that keeps me coming back decades later. This is the original Playstation game ported to iOS with newly animated cutscenes. Up until 2008, the only options for someone who wanted to play Tactics was to hook up a Playstation 2 or play the similar Gameboy Advance title published in 2003. Advance is a good game, but the story isn't as compelling and some new mechanics spoil the joy of out maneuvering an opponent with random restrictions on abilities and items. The most notable of changes is the addition of the Judge. In some battles, new rules would be put into place and offending characters would be carded like in Soccer; eventually removed from play if they repeatedly broke the rules. While this added a bit of randomness for those who grew bored during frequent "grinding" periods in the game, I felt it ruined all the planning and effort I'd put into my team. What good is working to steal a special weapon if some ethereal Judge figure comes down and outlaws swords for the match? I think spent more time resetting my GBA to get a less crippling set of Judge's rules during an important battle than working through job trees. The only negative for this version I can think of is in the dialogue rewrite. The original dialogue felt appropriate, but the rewrite feels more like they took the original Japanese and translated it directly into Elizabethan English instead of Victorian English...Which I suppose is more realistic given the styled time period, but it just feels awkward and forced. "Unhand her you fiend!" would end up as "Remove thy hand from Lady Enderbessle, lest I run you through!" The original game had very few cut scenes. I believe there was just one opening cut scene that would play on loop on the game's main menu, but otherwise all of the cut scenes used in-game graphics. Much like the Chrono Trigger reissue, the original cut scenes were rebuilt entirely in a beautiful cross-hatched flat anime style. I miss the old cut scenes but its by no means a change for the worse. The camera is a little awkward to maneuver without a controller, but its better than hooking up a PS2 to play it. I've probably bought this game two or three times now, and I'm sure I'll buy it again when it comes out on a platform that supports all that muscle memory I built up playing the original with a controller. Summary: The bottom line is that if you've never played it, you should give it a shot. If you have and are looking for a way to kill some time during the holidays without taking up a whole TV, snag the mobile version. Even in this minified state, it's hands down one of the best games I've ever played.